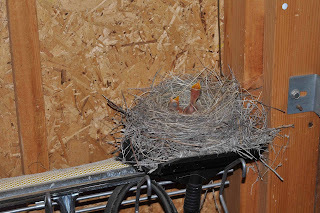 I was over at a friend's house last summer and found out that a bird had built a nest high up in their garage. While mama was out, I climbed up and took a few pictures. They had just hatched, and were hungry. Their mother returned shortly with some food, and eventually, when they got old enough, they all flew off.